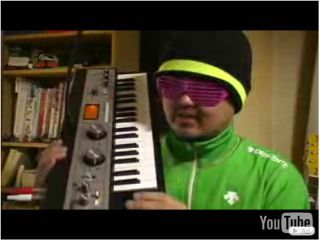 jetdaisuke puts the microKORG XL through its paces. Remember jetdaisuke, the chap who showed us how to turn the Korg DS-10 synth into a talkbox? Well, he's managed to get his hands on Korg's new microKORG XL, and he's posted a 'first impressions' video on YouTube. The whole thing is in Japanese, but it's pretty easy to get the gist of what's going on. You can watch jetdaisuke opening up the box, plugging the keyboard in and auditioning a few presets (including what sounds like a serviceable grand piano). You'll also see the vocoder in action via a curious version of When The Saints Go Marching In. Obviously, this is just a very quick test, but it's whetted our appetite for the microKORG XL still further. In short, we want one. Now.